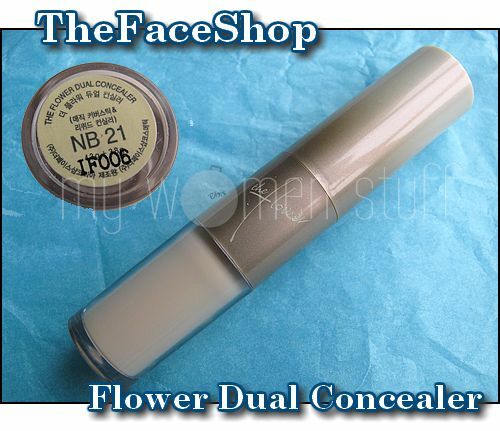 So that little anecdote brings us to the Flower Dual Concealer from TheFaceShop – an affordable line of Korean cosmetics. I first visited their store in Bugis Junction Singapore a few years back. I never understood why they are TheFaceShop and not The Face Shop – anyone knows? I came across The Flower Dual Concealer in the newspaper some time last year and picked it up that very evening while I as passing the store. Coincidence? I’d like to believe so! At RM46.90 a tube I figured it wouldn’t be that much of a strain on the wallet if it was a dud. But its not a dud! 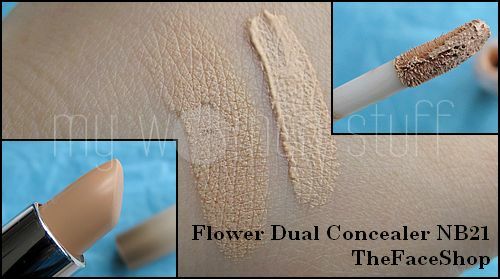 The Flower Dual Concealer is a dual ended concealer with a liquid concealer on one end and a cream stick concealer on the other ostensibly so one covers the under eye area and the other covers blemishes. I like the liquid concealer. The consistency is just right for the under eye without making it look cakey and covers up dark circles provided you aren’t bordering on Ling Ling the panda dark. The cream concealer looks like a lipstick (and is even shaped like one which I cannot understand :P) and feels rather dry. I find it does not work very well as a concealer because it does not cover my freckles thoroughly. However, I have found that if I warm up the cream concealer then dab a little on blemishes and then layer with the liquid concealer, it looks better. Perhaps its due to the slightly illuminating texture of the liquid concealer. Either way, it works so its a handy little multi-tasking tool! Have you tried anything from TheFaceShop that you like? For me, so far this is it! I’ve tried their easy eyeliner, Lip plumper and now their Freshian Tint and I really love it! I don’t recall that one but Maybelline has a dual ended concealer/highlighter we don’t get here. Not sure if you get it there? I’ve read many reviews that this concealer is one of those good ones. Apart from the packaging, I am also not wowed by TFS. For some reason, I have put off using any concealer until now! LOL. I can’t believe that with my dark circles, I didn’t bother to get a concealer. Now that you post on it, I think I may go get it someday. I bought this somewhere in Nov 09 and got 20% discount. It was my first concealer though. After much thought i just grabbed one and try it. I have to be careful while dabbing the liquid concealer under my eyes to not making it look cakey. Some people say u must use liquid foundation + face powder so that your look will be more natural. I dont use liquid foundation though, only mineral powder from laura mercier which is a lil bit sheer than the concealer. I still prefer to use my powder foundation but you’re right. You need a light hand with the liquid concealer. It doesn’t look too cakey on me though because I find the sponge does not pick up much product. i’m confused here. does this work like how BB cream is supposed to work? No. This is a concealer which goes on under foundation or BB cream (if you use it) and it is only used where you need it. but is it fine to “eat” the concealer o.o? Oh my! No the stick concealer is for blemishes not lips. I think the lipstick shape is confusing to some. It would have been better if they made it flat topped. I wouldn’t eat this although using concealer or foundation on lips is one of the tricks to help lipstick last longer. dear eliza, hmmm, I don’t think it’s fine to eat anything you put on your lips, unless they contain 100% edible grade ingredients. lol. I think wiping off your lips before eating is a safer choice. =) Hope this helps. ahhh…. cream side dry? bummer! 🙁 I bought their green tea blackhead remover thingy… meh. Ya the cream side is dry – works with the liquid but once the liquid’s gone I wouldn’t use up the rest. I heard that Korean cosmetics are really cheap but really good. i’ve tried the eye liner from the faceshop, bought it in Korea and it is just RM 7.00…eventhough is cheap but i don’t really like it. It melted all around my eyes after 30-45mins applied. I need to keep checking on the mirror and clean it with tissue…or else become a panda for all day long. Have had real good results with 2 of their sleeping masks and will blog about them soon. good timing to read your review when I’m thinking of getting a good concealer for my pimple scars ard my jawline. i’m trying to get one with good coverage yet not too drying. Will check this out. Btw, do you reckon what’s the best way to keep the concealer intact on your face? Patting powder over it should help it set better right? Yes a light dusting of powder will help concealer stay on, the say way as liquid foundation. However, do be careful not to pat on too much or it’ll look cakey. For blemishes, I still stick to my Make Up For Ever Full Cover. Nothing can beat it yet. I have no idea to be honest. It does last on my normal-combination skin the whole day. I don’t have oily skin and I always have it under foundation so perhaps the foundation helps hold it in place.